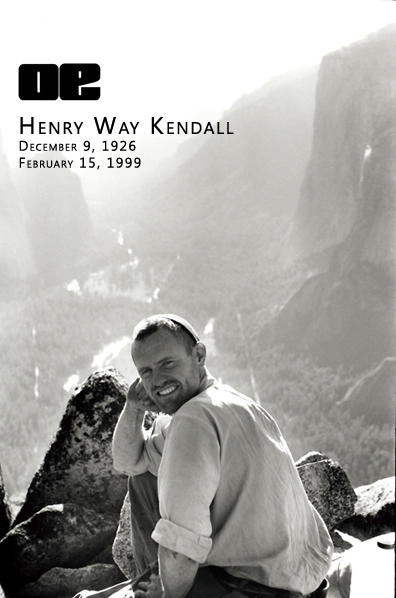 In addition to his extensive scientific and advocacy work, Henry W. Kendall led an active life. He was also a very skilled mountaineer and photographer, who did extensive rock climbing in Yosemite Valley, followed by expeditions to the Andes, the Himalayas and Antarctica, photographing his experiences with large format cameras. Henry Kendall documented all his climbs, first with simple 35mm equipment, then with medium and large format cameras, and at times with 16mm movie cameras. He did exploratory diving and made advances in underwater photography. He did exploratory diving and made advances in underwater photography. He also took active interest in maritime history. He did exploratory diving and made advances in underwater photography. He also took active interest in maritime history. Kendall died while diving the cave at the Edward Ball Wakulla Springs State Park, Florida as a part of the Wakulla 2 Project. He by-passed two pre-dive checklists for his Cis-Lunar MK-5P Mixed Gas rebreather and entered the spring basin without his dive buddy from the National Geographic Society. Kendall missed turning the oxygen supply to his rebreather and lost consciousness and drowned. The autopsy revealed a physiological issue that led to his disregarding the protocols.